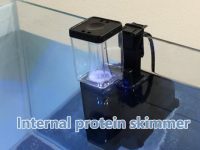 How to test aquarium salinity with a refractometer? It is essential to maintain the right concentration of dissolved salts in the aquarium to preserve the health and life of its inhabitants. There are many tools available in the market for you to measure the concentration of dissolved salts in your aquarium. Compared to other salinity testing tools, refractometers are cheap, more accurate and fairly easy to use. This tool makes salinity checks a simple and uncomplicated process. What is a refractometer and how it works? 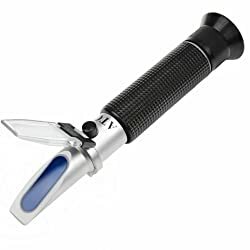 How to use a hand held refractometer? 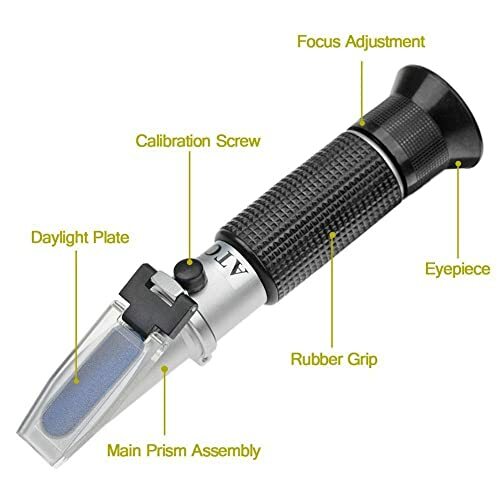 How to calibrate a refractometer? 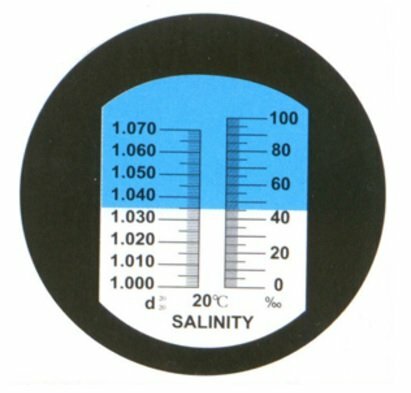 How to correct marine aquarium salinity? When a light ray moves from a rarer medium like air into a denser medium like glass, solutions, plastics, etc., it bends. This refraction of light is due to the change in the speed of the light when it goes through different materials. The ratio of the speed of light in vacuum to that in a substance is the refractive index of that substance. The refractive index of a substance varies depending on the concentration of dissolved particles in it. The saltier a solution is the higher refractive index it is. The refractometer is fitted with a prism and lenses to measure the reflective index of a substance and convert it to salinity. First, calibrate your refractometer with distilled water or a commercial solution with known salinity. This increases the accuracy of the reading. More details in the next section. After the refractometer is calibrated and reliable to use, wipe off the calibration fluid on the prism assembly. Place 2 – 3 drops of the aquarium water on the prism assembly and shut the daylight plate (the transparent lid mounted on the hinge). Point the device toward a light source and read the result by looking through the eyepiece. In the eyepiece, you will see the previous display scale. The horizontal division line shows the salinity in two different units, sg (specific gravity) and ppt (parts per thousand), which are commonly used in the hobby. The more salty a solution is, the higher specific gravity it is. Specific gravity is the ratio of the density of a material to that of a standard one at a specific temperature. While air is the standard for gases, pure water is for most solids and liquids, including salt water. 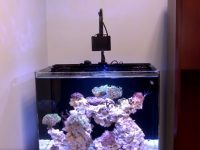 Saltwater aquariums are usually maintained at a specific gravity range around 1.025. This number means the ratio of the density of the aquarium water to that of pure water is 1.025. 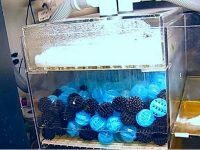 Because the density of pure water is approx 1.0 (0.99823 g/ml) at 20°C (68°C), this number is also the density of the aquarium water at 20°C. IMPORTANT! Temperature significantly affects the reading of the refractometer because it changes the density of the water. The d20/20 signal in the display scale of the refractometer means the density ratio of the measured sample at 20°C to pure water at 20°C. Some refractometers require you to compensate for the temperature but it is better to buy a model with automatic temperature compensation (ATC). You should calibrate your refractometer when using it the first time or after long periods of dormancy. You will need a calibration solution with known salinity that is lab precise and provided by the manufacturer. The work of calibration is to ensure that your device reads the same salinity as the standard calibration solution. For example, the previous is a calibration solution with the salinity of 1.0246 sg (or 35 ppt). 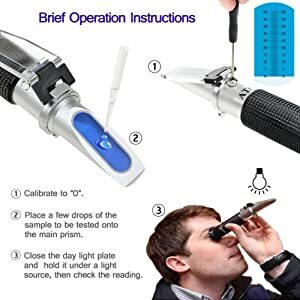 For calibrating, place two to three drops of the solution onto the prism assembly of your refractometer. Then look through the eye piece while turning the adjustment screw on the body of your refractometer until you see the scale inside reads 1.0246 sg. Now your refractometer is well calibrated with the standard solution and believable to use. 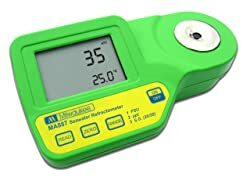 You can also use distilled water and adjust the reading scale to 1.000 sg (or 0 ppt) for calibration; however, using a commercial solution that has a salinity near to what you need to measure is more preferable because it is more accurate. Include: a cleaning cloth, 3 droppers, a screw driver, and a user manual. This hand held refractometer is intended for aquarium salinity measurement and marine monitoring. It is very easy to use as my guide in the previous sections of this article. You can calibrate it by distilled water or a calibration solution if you want. It displays results in two units – ppt (part per thousand) and S.G. (specific gravity d20/20). It is able to measure salinity in the range from 1.000 – 1.070 sg (or 0-100 ppt). The reading resolution is 0.001 sg (or 1 ppt). This refractometer features an automatic temperature compensation function. If your ambient temperature is within the range from 0 to 30 degrees Celsius, the device could give accurate salinity results without any need for corrections. The product comes in a strong plastic case that houses a refractometer, a cleaning cloth, 3 droppers, a screw driver, and a user manual. Include: a case, a calibration screwdriver, and a pipette. 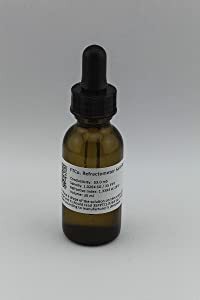 This refractometer is intended for marine and saltwater aquarium applications. 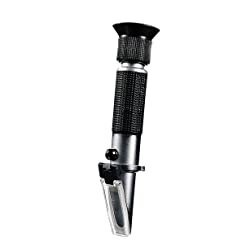 It is also a hand held refractometer like the previous. The use is completely the same. However, the 2-year replacement guarantee from the manufacturer makes it a very popular choice among a huge amount of similar products in the market. It is economical and easy to use as it does not require a calibration solution. It can be calibrated with distilled water. You only need to calibrate it on the first use or after long periods of non-use. It measures salinity in two scales, specific gravity and parts per thousand with the accuracy of ±0.1‰. The dual scale ranges from 0 – 100 ppt and 1.000 – 1.070 sg. The automatic temperature compensation (ATC) function makes it easy to use and gives you accurate readings. The complete package also comes with a case, a calibration screwdriver, and a pipette. Include: 9 V AA battery, instruction manual. This is a digital refractometer. The LCD displays salinity results in specific numbers for easy and accurate reading. It is intended for a number of industrial applications. Because of its very road salinity reading range (1.000 – 1.114 sg), it works well for saltwater aquariums as well as natural marine environments. 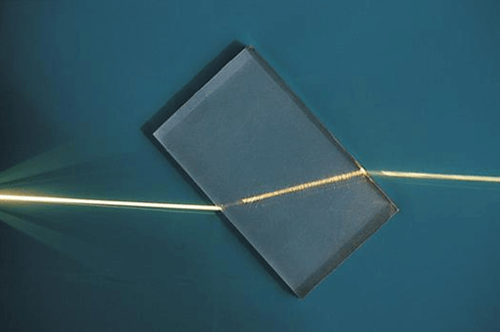 This optical device is simple and easy to use. It requires a simple calibration using deionized or distilled water and the “ZERO” button. 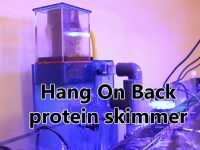 To use the device simply place a few drops of your aquarium water in the sample well and press the “READ” key. The “RANGE” button is for switching reading units. You can choose one of three common measurement units including ppt (parts per thousand), S.G. (specific gravity) and PSU (Practical Salinity Units). The temperature can be chosen either degree Celsius or Fahrenheit. The unit is programmed with an Automatic Temperature Compensation function (ATC) that works for the temperature range from 0 to 40°C. This battery-operated device has a low power indicator and a 3-minute automatic turn-off when not in use. Change the specific gravity (sg) by no more than 0.001 in a day. A greater change can cause shock or death to aquarium inhabitants. Correct salinity gradually over the course of a few days if necessary. To lower the salinity of your saltwater aquarium, remove a small amount of water from the tank (<10%) and replace it with the same amount of distilled water. Then measure the salinity using a refractometer. Do this daily till you have the desired reading. You should make observations and take measurements daily. Due to the evaporation of water, the salinity may increase in the tank. When topping off a saltwater aquarium, use pure rather than salt water. Salt does not evaporate with the water in which it is suspended, thus it remains in the water left in the tank. Topping off with salt water results in salinity increment, which can kill the aquarium inhabitants. 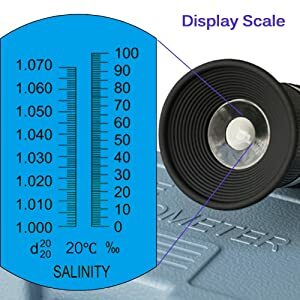 To increase the salinity of your saltwater aquarium, add a small amount of sea salt to the tank, then measure the salinity using a refractometer. Do this daily till you have the desired reading. 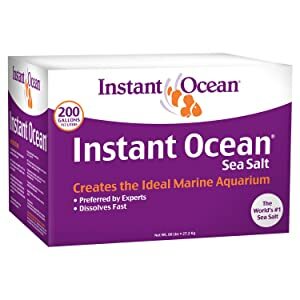 I strongly recommend Instant Ocean sea salt. This product is carefully formulated to provide all minor trace elements for your corals and fish. It is phosphate and nitrate free. 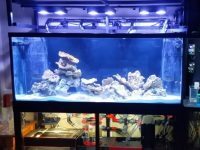 How to use live rock in a saltwater aquarium? 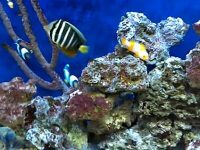 How to set up a saltwater aquarium (fish-only and reef)?